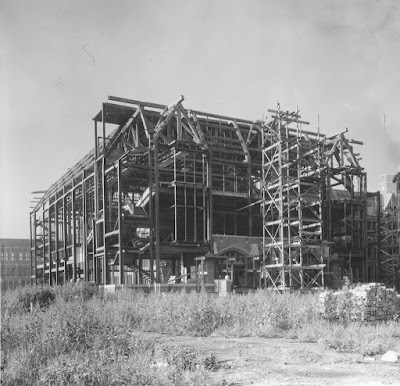 June 24, 1930 – The first scoop of dirt is dug at the southwest corner of Addison Street and Western Avenue, and the construction of the $5,000,000 Lane Technical High School is under way. Ten thousand people are on hand as Alderman John J. Hoellen of the Forty-Seventh Ward pulls a lever in a steam shovel to get the work started. High schools represented at the ceremony include Tilden, Crane, Austin, Lake View, Senn and Schurz. Lane Tech Principal Grant Beebe says, “Lane has taken a place in the educational system that is national and international. We long ago outgrew our facilities and now our needs have been answered. 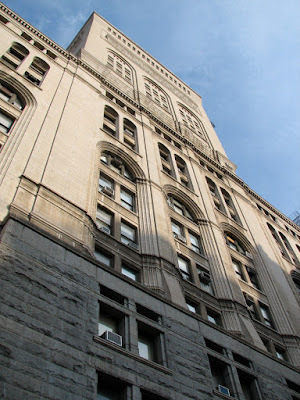 The place a technical school fills in American civilization is shown by the records of our graduates.” [Chicago Daily Tribune, June 25, 1930] The school replaces an earlier school that stood at Division and Sedgwick and is named after Albert Grannis Lane. Born in Chicago in 1841, Lane became the youngest principal in the history of the Chicago public school system, later serving as Superintendent of Schools in Cook County and as the President of the National Education Association. The photo above shows the great school under construction as the 1930's begin. June 24, 1942 – The State’s Attorney files a foreclosure suit against the Auditorium building at 430 South Michigan Avenue as plans move forward to auction the building’s art and furnishings. The building, with its combined hotel, theater, and offices, owes $1,346,584 in county taxes and penalties. Plans are for the property to be sold to the highest bidder within 60 days. If no buyer is willing to buy the building for a significant portion of the amount owed in back taxes, the county controller is authorized to bid on the building for the amount of those taxes. If that occurs and the owners do not repay that amount within two years, the property can then be sold to the highest bidder who will receive a clear title. Everything will go – theater scenery, 3,665 seats, glassware from the bar, even the chairs from the boxes where the elite of Chicago society once sat to escape the smoke and the smell of the city.